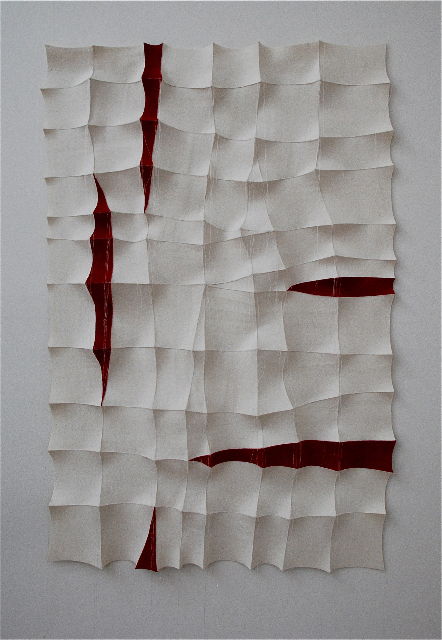 Two people won Kitty Korver's small works below as a result of the readers-action of Textiel Plus. This magnificent work by Chung-Im Kim is made available for us to sell to support our precious exhibition, "Sculptural Felt International"
In shadowbox 25.5 * 25.5 * 4.5 cm. 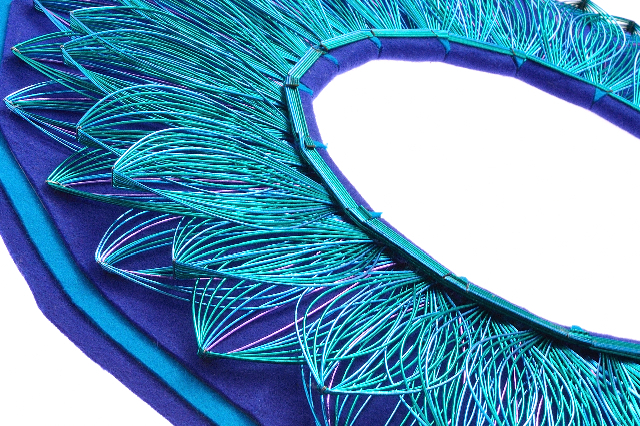 The materials are industrial felt, threads, and the images are manipulated in Photoshop, then printed, cut and hand-stitched. Part of "Brain Series"
An impression of the works of our exhibition. There were ±75 works exhibited. See Facebook for some overall photos. An international traveling felt exhibition, in which the works do not only cross borders of countries but also the technical boundaries of traditional felt making by combining it with other techniques, shapes and or materials. 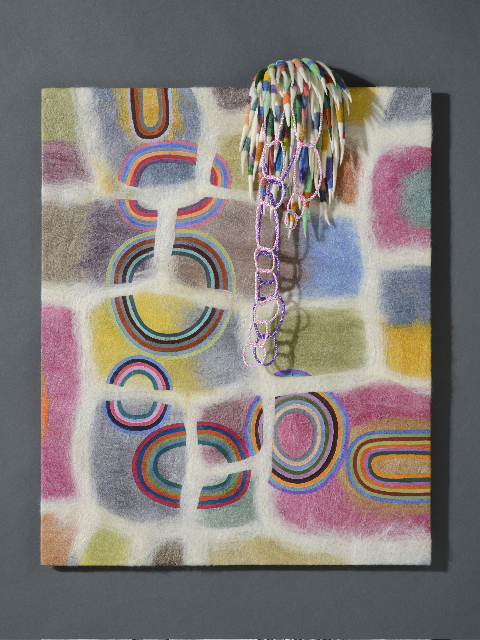 The participating artists did not confine themselves to the more traditional forms and techniques you often see in felt, but explore the possibilities of different techniques and material used in combination with felt or the technique of felting. They have crossed borders towards for example sculpture, ceramics, graphic design or have mixed felt with modern and digital technologies. The works exhibited emphasize innovation in felt, they display diversity, originality and quality. Here a link to the facebookpage. Chung-Im Kim works with industrial felt. 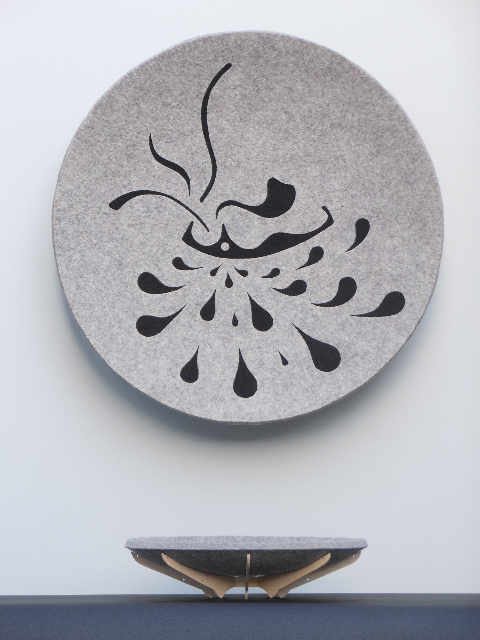 The three-dimensional surface in her wall pieces results from close investigation of material behavior while combining 2-D images and 3-D forms using both digital and traditional techniques. Rebecca Howdeshell uses industrial felt, unprocessed wool felt, paper and other materials to reference archaeology, geological events, organic and geometric form, structure and line. She creates her low relief wall artworks using stitching by machine and hand to create textural and dimensional embroidery. 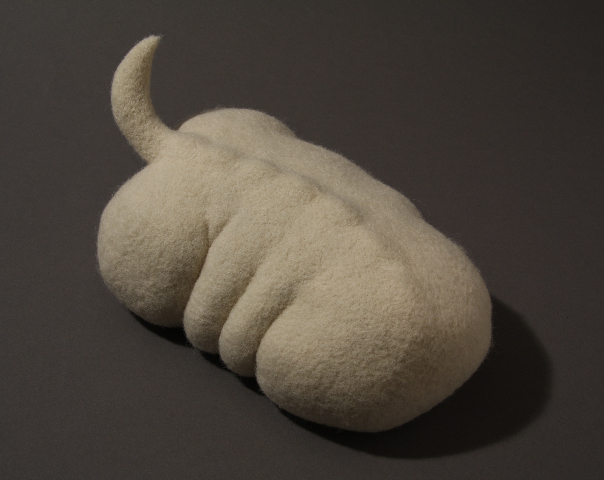 Kitty Korver uses the technique of wet felting to create concave forms out of thick layers of wool. 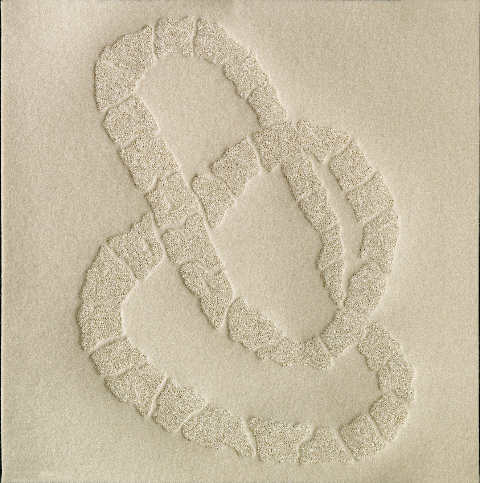 She carves a relief into the surface and needle felt graphics or uses delicately placed wool fibers to create an image. Her work often tells about our vulnerability and strength. 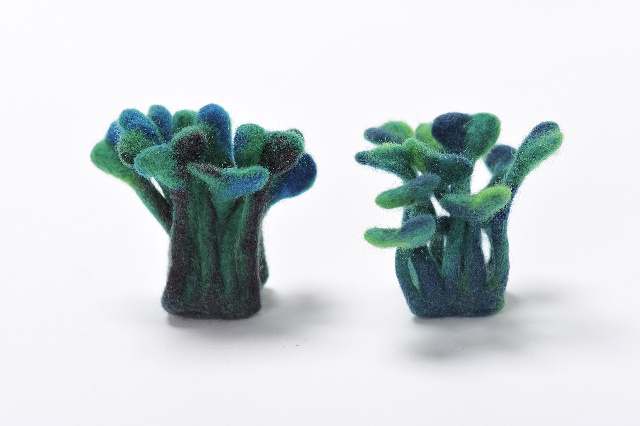 Stephanie Metz uses the technique of needle felting to create three-dimensional sculpture addressing the way humans manipulate the natural world. Her innovative use of felted wool exploits its unique sculptural and conceptual qualities: as a sculpting material wool is both fuzzy and soft but also firm and structural, and it carries with it layers of associated biases and assumptions. In her ‘Teddy Bear Natural History’ pieces she presents coolly scientific yet cuddly anatomical specimens of teddy bears – complete with sharp canine teeth- that expose the human conceit that nature can be tamed. 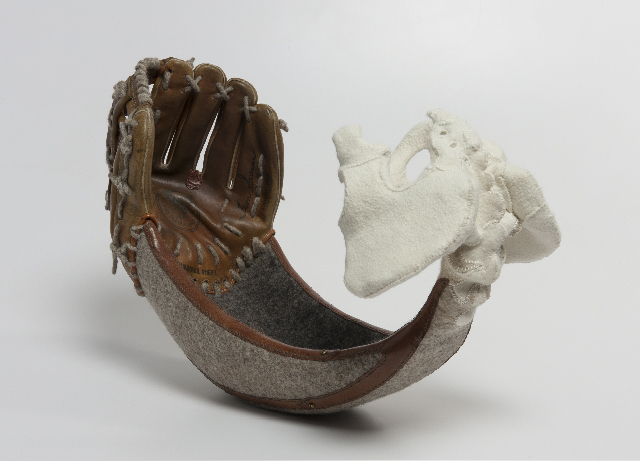 Anita Larkin makes sculptures from found objects and felt that suggest a function. Crossing boundaries of craft and sculpture, she brings together an ancient textile with modern refuse. The innate properties of felt speak metaphorically about human issues within her conceptual works, that often explore contemporary nomadism and issues of miscommunication and identity. ﻿The natural world inspires me: its sounds, feel and touch, the textures and forms. My work is inspired by feelings, thoughts and dreams. For several years I have tried to shape, sculpt, fold and cut this warm and woolly material through the process of felting during which it metamorphoses from an array of loose colorful fibers to a strong sturdy textile. "Feel the fear and do it anyway" is an underlying emotional energy which urges me to create forms with wool. It is not a visual or intellectual motivation but more a gut feeling. 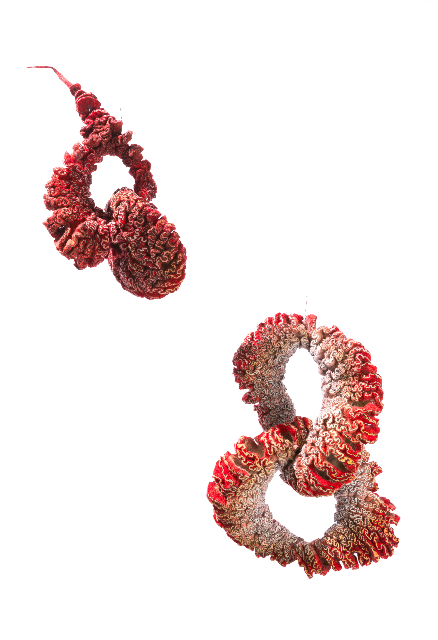 Though sculpture is usually perceived as static I see it more as movement, the movement of wool from fibers into felt. And as long as there is movement there is life. Sarah Owens is interested in forms that emerge from a process, as in evolution, and often used evolution as a metaphor for her creative process. Rather than separate the design and construction phases, she sketches in the materials, fascinated by an accumulated history of subtle adaptations embodied in a final form. Fiber has been a very rewarding medium, albeit completely unexpected. I found myself in need of a new art form and “discovered” the potential of wool by happenstance. Discovering the artistic possibilities of fiber opened the door to a vast realm of novel techniques & materials, unlocking, as well, a window to new ideas and to past history. After nearly a decade working with them everyday, I continue to feel that the experience is new and that I am learning from the project at hand. When asked to describe himself, Marcel Duchamp famously said “I am a breather.” I would describe myself as “I am a learner.” Fiber & art practices allow for a constantly challenging, ever-changing journey in learning. I make the jewelry work in the image of plants and flowers. Using two colors mixed together in the process of felting, to create a gradient color. The form is made by combining some small bags and sheets in traditional techniques. Jantine Koppert finds inspiration in the natural world and landscapes to create her works of art. 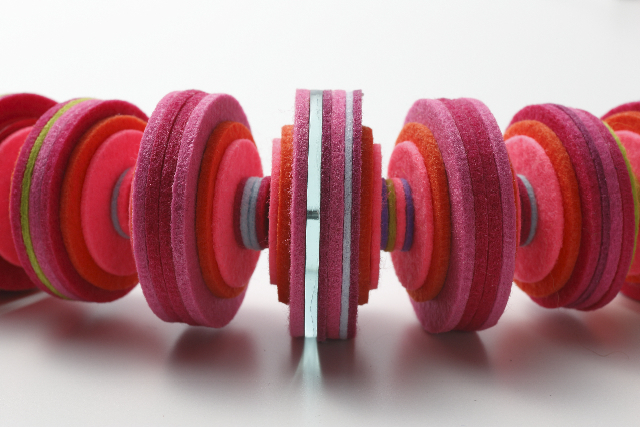 Industrial felt gives her the possibility to combine color and lines in her sculptural pieces. 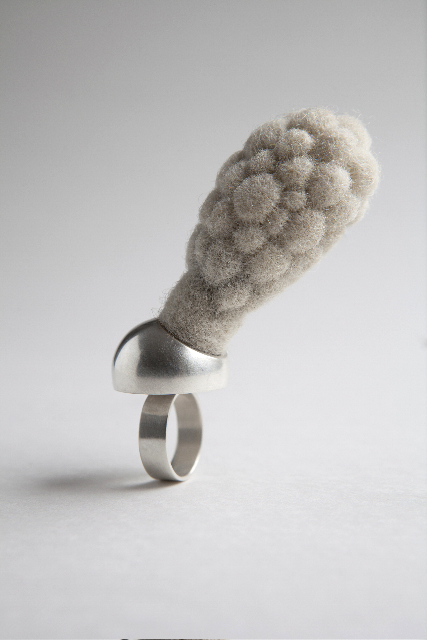 Meiri Ishida creates jewelry made of industrial felt slices combined with silver and Plexiglass. She makes delicate color layer of resin processed felts. The hardness of this material makes it possible to make sculptural forms and gives it a wearable function. She expresses the colorful and humorous world by using this creative material. Hiroko Sato-Pijanowski is working on jewelry that combine felt with Mizuhiki, a ritual japanese material: paper cords which looks like gold and silver.